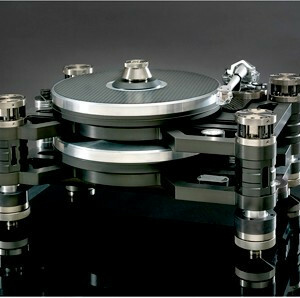 In just a few years, Kronos Audio Products has become a leader in the turntable world. Kronos has won over 35 awards and “Best of Shows” from the international press along with glowing reviews from the world’s best audio journalists. How can we explain this success? 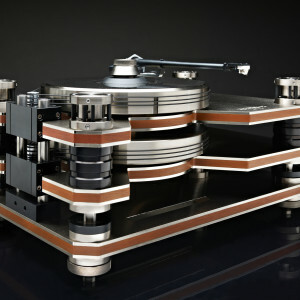 To put it simply, we aim at building turntables that are truly musical and faithful to the recorded material. To this we add the best performance/price ratio in the marketplace. Finally we strive at building products that are easy to maintain and are built to last. The first thing that distinguishes a Kronos turntable is its two equal mass platters, rotating opposite each other. We call this the dual platter counter-rotating revolution. It is a means by which the vibration inducing torque force, present in suspended turntables is eliminated. The result of this design is a suspended platform particularly well isolated from environmental and mechanical noise while maintaining unequalled stability. You can immediately hear the difference dynamic stabilization makes. No other turntable can offer its advantages. Besides this, all of the Kronos turntables components keep other parasitic vibrations to a strict minimum. Our designs apply proven and solid technologies and use materials with complementary properties. Our groundbreaking DC computer controlled drive systems deliver outstanding speed control while remaining vibration free. Our proprietary hyper precision platter bearings rotate smoothly and are maintenance free and durable. Our plinths combine composite materials and metals so as to offer rigidity and minimize acoustical feedback. Our suspension is designed to be highly efficient as well as easy to set up. Finally, with the help of recording engineers, our turntables have been fine tuned and optimized by comparing their test pressing playback performance to those of original master tapes. This comparative testing process has directed our work in achieving a neutral frequency response, natural timbres and transients and outstanding dynamics. It is no wonder Kronos turntables are being used in award winning presentations all over the world. Kronos turntables are also chosen by music industry professional and by audio equipment manufacturers. But most importantly, Kronos turntables are providing enjoyment and pride of ownership to members of the audiophile community. Interested in adding this brand to your portfolio? If you would like the opportunity to stock any of the brands we supply please get in touch and we will get back to you as soon as we can.